The 321 Smart Arm is an affordable articulating arm that delivers a powerful solution for your mounting needs! It is ON SALE now! 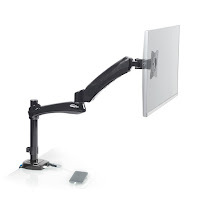 · This articulating arm is SMART! It comes with an integrated USB port that accommodates a 3.0 USB. · Easily adjust the monitor height and position with just a fingertip. · The 321 boosts an outstanding 19.5” of height adjustment allowing the user to ergonomically and comfortably position the monitor. · The built-in spring tension gauge enables various monitor sizes and weights ranging from 0-19 lbs. · Polished aluminum construction offers greater durability and enhanced aesthetics with a silver finish. · This solution allows for 360 degrees of monitor rotation, 180 degrees of pan and a tilt range of -90/ +90. 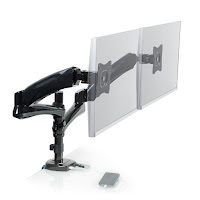 This incredible variety of monitor movement allows for the user to choose the very best ergonomic position for them. Trust me, you don’t want to miss out on the amazing deal! Get your 321 single or dual smart arm while supplies last!